The captivating rhythmic drumbeats of soca and calypso music echo across the broad green of the Queen’s Park Savannah and radiate out to the forested hills overlooking the city of Port of Spain. As you approach the central grandstand the sound grows louder, more varied, the syncopation more subtle. In the dusty forecourt crowds of dancers wait their turn to cross the stage with their bands, dancing to the beat. Bronze girls with burnished breasts and glitter undulate in the brilliant sun. Young women in blue and red feathers, their skimpy outfits bejeweled and tasseled; muscled young men in capes and helmets, shimmering ebony and bare-chested; couples ‘wining’, thrusting their hips suggestively; grandmas who barely fit into a bikini; old men in sailor costumes; even the youngest of children; all of them follow with their footsteps the penetrating rhythms of Trinidad and Tobago Carnival. Here everyone is welcome – people of every culture and interest. Bankers and lawyers, street folk and rasta men, tourists from London, New York and Rio; the well-to-do and the not-so; all of them swirl and wheel, jump up and get down, moving to the incessant beat. 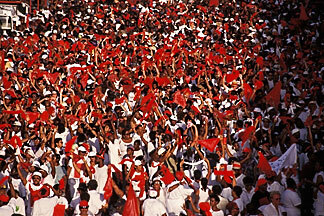 The grandstand is the last stop of their long parade through the streets of Port of Spain, Trinidadâs capital. At the edge of the stage the dancers are held back by security with batons until the previous band has cleared. When freed they surge across the platform, whirling and performing for the judges at the reviewing stand, posing for photographers, mobbing their friends, swigging from water bottles and jumping up, jumping up, without end. In the stands the audience at times seems smaller than the crowd on the stage. Carnival is essentially a participant festival. Even first time visitors can find a place in a band and a costume for a reasonable price. And they all are carried along by the music. One of the songs will win Road March, the coveted award given to the song played most during this annual pre-Lenten bacchanalia. This year’s top contenders are the mystical lyrical David Rudder’s High Mas, the jouncy Footsteps by Wayne Rodriguez and Xtatic’s Toro Toro. Trinidadians are already familiar with the tunes by Carnival week. 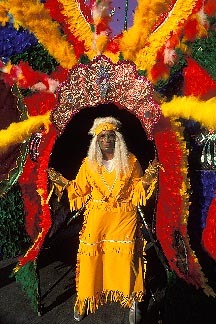 By then each of the twenty bands has selected a theme and developed elaborate costumes, many hand-sewn in the âmasâ (or masquerade ) camps in the working-class neighborhoods of Port of Spain. 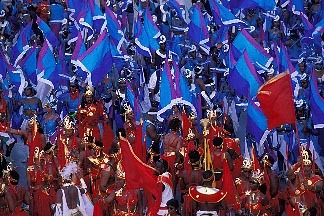 Themes vary from the tapestry of life to bark-clad Carib and Arawak Indians (Trinidad’s earliest inhabitants) to helmeted warriors, to sailors in whites, to a celebration of color with a rainbow of red, blue and green. The most elaborate costumes are for the king and queen of each band. Some are enormous, four meters high, with mechanical arms and legs, or splayed feathered entourages supported on wheels. Like “dancing mobiles” (a phrase from Trinidad’s best known choreographer Peter Minshall) they move with grace and expressive energy. A Friday night king and queen competition recognizes the most creative entries. The actual parades begin on Monday well before dawn. Mud-daubed revelers pour into the streets at 2am for Jouvert (from the French Jour Ouvert or opening of the day). 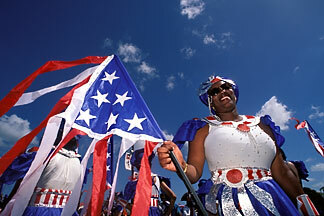 Some carry branches to symbolize liberation, the passage to Carnival. Coated in axle grease or brown mud they show their earthen roots. Even passersby are fair game to by splattered with mud and good cheer. By midday the mud-people are gone and the first parade of mas bands begins. Starting on the outskirts of town each entourage winds along the parade route through downtown and up Frederick Street, past several reviewing stands before the final stage in the Savannah. Sidewalks are packed; the streets jammed with people. 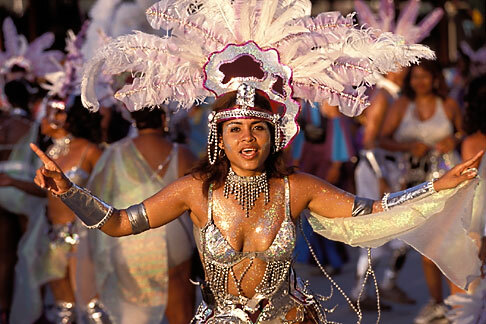 Up to 700,000 people descend on Port of Spain for the week, tripling its normal population. For the heat-weary, refreshment stands sell mangoes, coconuts, shark and bake (a local concoction with grilled fish in pocket bread), ice cream, fresh-squeezed fruit juices and the ubiquitous Carib beer. Some bands are small, only twenty steel drums drawn on a motorized trailer; others have up to five thousand people, divided into subgroups with variations of costume. 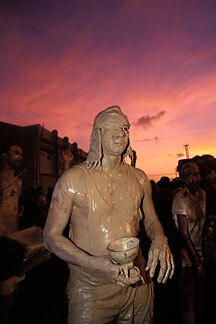 Masquerade has been a tradition in Trinidad since the early days of French plantation owners in the 17th century. Christmas to Lent was a season of fancy balls with king and queen costumes modeled after the masked balls of Versailles. African slaves on the plantations did not join in but found outlet in song and torchlight parades during the cannes brulée celebration at the end of the sugar cane season, when the fields were burned and the heavy labor of the harvest was over. With emancipation in 1838 Christian and African expressions mingled, drawing in worship of the traditional gods Shango and Obun and masked dances from West Africa. This African presence is seen by many to be at the center of the Caribbean ethos. The undercurrent of drums hearkens back to chac-chac and tom-tom drums from Africa. Bells and rattles, sticks, tin kettles and salt boxes were added to the rhythm along with, more recently, paint cans and brake drums. When the colonial government banned drums in the Victorian era, inventive musicians turned to tamboo bamboo, cured lengths of bamboo. Later came fifty-five gallon steel drums (pans) which players shaped to give distinct tones. 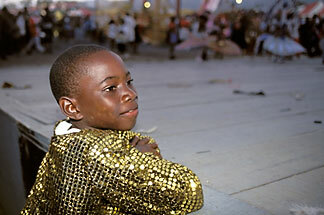 The result is the steel band, the foundation of Carnival music. In the Pan-o-rama competition on Saturday night steel bands play off against each other for prizes and national recognition. Also from Africa have come improvised call and response singing, with a leader calling out to the crowd. In calypso music social commentary and satire, even verbal dueling between groups, bring to the surface the mood of the people. The best known calypso singers, from Lord Pretender in the 1920’s to the Mighty Sparrow and Calypso Rose are always national heroes and known for their pithy and pointed lyrics. Traditional mas characters, though less common now, reflect a heritage of masked ritual in African cultures. Moco Jumbie is a tall stilt dancer with West African origins. Horse head masks come from Mali. The rag tag Pierrot Grenade dresses in old bags and colored cloths and twirls around while carrying on a satirical pitter-patter. At first glance Carnival is a time of wild abandon. Under the surface though, it is a time when the heart of the people, the soul of Trinidad, is expressed and recognized. Politics are part of it. In calypso the marginalized of society find voice through satire and song. In this it is a great equalizer. “This is our grand release. We sing dance laugh and boogie for two days and four nights. 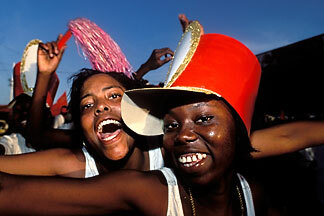 We are purified and revitalized through Carnival,” explains one Trinidadian. By late Tuesday night the energy reaches a climax. On-stage the charismatic David Rudder pours out his song High Mas urging people to âthank God for life and give praise,â as they lift their voices and cheer with a mix of celebration and awe. Peter Minshall’s band follows as the grand finale. For the world- renowned choreographer (with Atlanta and Barcelona Olympic credits), Mas is theater, “a universal performance language.” His productions are eagerly anticipated and this year’s Red is not disappointing. First a few eerie red-hooded harbingers cross the stage sweeping, clearing the way. Then follow figures carrying large letters spelling out R and E and D, then dancing stilt men, modern day moco jumbies, all dressed in red. Then come larger groups with sickles and scythes and rakes and swords. A swathe of red costumed, horned and caped figures they swirl their way forward, a mysterious army of red making masquerade. In the middle in a quiet moment a single caped man, completely covered, head down, eyes averted, slinks along the stage. After the last players pass all is quiet. By early morning even the bravest partygoers have faded into sleep. The next day I read that the Road March prize went to the catchy Footsteps. The refrain echoes in my ears as I head for the beach in Tobago. 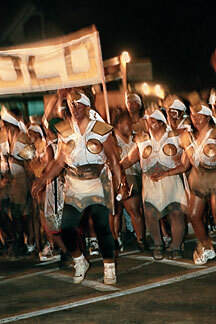 Meanwhile back in town Trinidadians begin work for next yearâ’s Carnival. 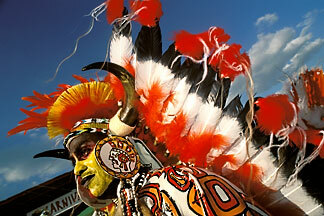 For more information on next years Carnival visit the Trinidad and Tobago Carnival website. I love Trinidad and the theme of Carnival. Boston, NY, Montreal, Miami, Toronto, they're all really great. But the home town to the best party on earth has to be in Trinidad. Great shots.